Description: Packet includes: 67 fill-in-the-blank homophone exercises and an extensive rewriting exercise (that focuses on homophones). This packet explains how commonly misused homophones should be used (and provides tricks for figuring out which homophone is correct in different contexts. The lessons cover uses of: there/their/they're, your/you're, it's/its, accept/except, let's/lets, our/are, and effect/affect. Each lesson is followed by an exercise in which students must use the correct homophone in a range of different sentences. The packet concludes with a short story (just over a page long) with homophones used both correctly and incorrectly. Students must identify and correct the incorrectly used homophones. 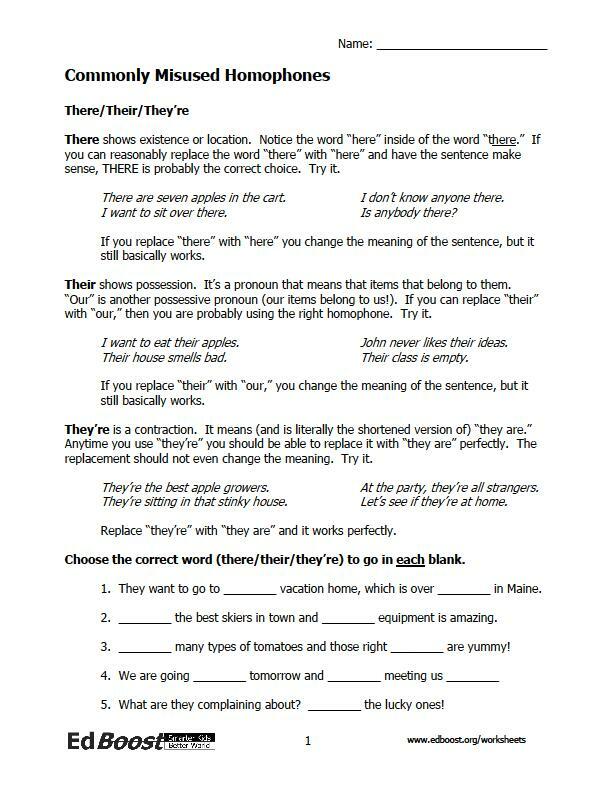 Overall, the packet encourages students to do a range of work with different homophones with the goal of helping them to understand how to use different homophones, how to identify when homophones are used incorrectly, and how to get used to using them correctly in writing. Sample Problems: Choose the correct word (lets, let’s) to go in the blanks. 1. “________ go to the mall this afternoon,” said Charlotte. 2. “No, ________ go to the pool instead,” said her sister Maeve. 3. “You know mom never ________ us go to the pool by ourselves!” Fix the homophone errors in the following passage – please! The passage doesn’t make any sense! But be careful, some of the homophones are actually correct. Don’t be tricked. Simone, Our Unhappy Little Princess Once upon a time there was a grumpy princess named Simone. Simone’s parents, the king and the queen, wanted their daughter to have the best of everything, except fun. They constantly told Simone, “It’s your duty. You must accept it. You must try to make your parents happy!” Note: This packet strives to push students to think about commonly misused homophones and learn to use them correctly. But, it contains some difficult exercises and is best suited for students who are good readers. Best for students in grades 4th and up. The first page of each packet is available for viewing by clicking on the image on the right.